I received a .dwg file that was not made with and Autodesk product. It was converted from a program called VectorWorks to a .dwg format. When I received the file, the file size was 7.96 mb and contained 37525 objects. After I ran the Express Tool OVERKILL, it deleted 30599 useless/overlapped objects and reduced the file size to .98 mb. and sped up the computer’s performance a lot. The OVERKILL dialog box is where you can see all of its glorious power. Here you can tell OVERKILL to ignore certain properties and at the bottom is where my favorite features are located. Polylines that have too many vertices will be simplified and overlapped objects of the same layer and length will be deleted. I would suggest using this command along with PURGE and maybe even an AUDIT just to be safe. You may want to use this before sending this to other people or before you file away a completed project just to reduce the file size. So try this on a file and see if it speeds up you life. It surely worked for me. The upper portion called “Object Comparison Settings” are all unchecked by default. These are properties that if checked, Overkill will ignore. 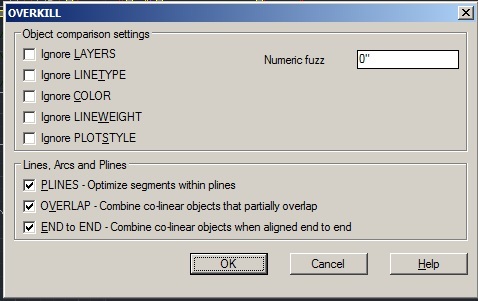 The “Numeric Fuxx” is the “Fuzz factor” and it is set to 0 (zero) by default. This looks for how closely objects are overlapped. 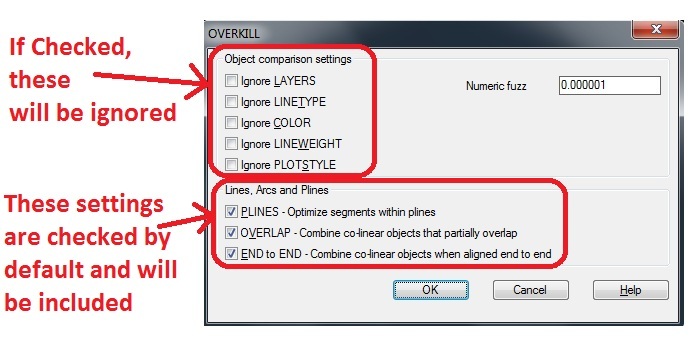 So if you have two lines that look overlapped, but one is ever so slightly off – you can increase this “fuzz factor” and overkill will look for objects that are ever so slightly overlapped. This entry was posted in Express Tools, Settling In, TIPS. Bookmark the permalink. Could you please explain what are the “Object comparison settings” options for? What they do exactly? Thank you very much. Congratulations for your blog! Sorry for the delay in getting back to your question. I have added an explanation at the bottom of the post. I have a drawing with 293,000 odd objects in it. I swear I can see smoke coming out of my laptop!